HP has released the DreamColor Z32x: a mammoth 31.5-inch UHD display. As well as being the biggest DreamColor monitor to date, the new model is the first 4K DreamColor display. 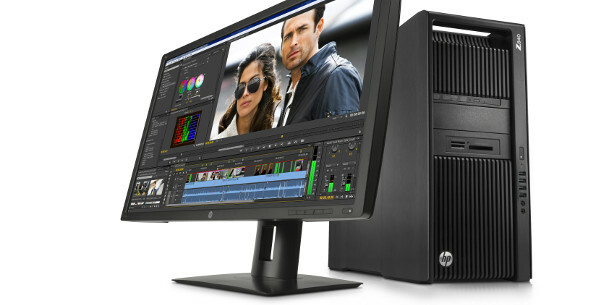 The new monitor was announced at NAB 2015, along with the Omen Pro mobile graphics workstation, and the Z Turbo Drive G2, the next-generation of HP’s high-speed PCIe SSDs. Developed in collaboration with DreamWorks, the – recently Scientific and Technical Academy Award-winning – DreamColor product range is designed to provide animators and VFX artists with accurate LCD displays. The Z32x takes the same technology as the existing 24- and 27-inch models, and expands it to a 31.5-inch panel with a maximum display resolution of 3,840 x 2,160 pixels. It comes with a 10-bit factory-calibrated colour gamut and a static contrast ratio of 1000:1. As with previous DreamColor monitors, it has a horizontal and vertical 178° viewing angle, and can be pivoted into portrait as well as landscape format. It’s also HP’s first HDMI 2.0 display, which gives it a 60Hz maximum refresh rate. Other connectivity includes 1 x HDMI 1.4, 1 x DisplayPort 1.2, 1 x Mini DisplayPort and four USB 3.0 ports. The DreamColor Z32x is due to ship later this summer. HP’s official news release lists pricing as “available on request”, so don’t expect it to be cheap: its 27-inch sibling currently costs $1,500.